I’ve never met a training or HR practitioner that doesn’t want to “have a seat at the table” – that is, be perceived as being relevant, strategic, important, and influential. It’s a basic intrinsic motivational need, and even more so for today’s knowledge workers where the work output is less tangible and visible. Unfortunately, not many are. While a few training, HR, or OD departments have reached this lofty pinnacle, others still languish in obscurity, soon to be the victims of when the next cost cutting ax falls. I’ve been a part of, or the leader of, both of these scenarios, and everything in between (it’s often not an either or). I’ll borrow an idea from Bersin and present my own 4 Stage Leadership Development Model, along with a few tips on how to advance in each stage. This is the practitioner or group that’s buried deep down in the HR org chart located in some remote building far from headquarters. They have little access to senior management. Morale is poor, and cynicism, sarcasm, and second guessing run rampant. Programs are often flavor-of-the-month, off-the-shelf, and disconnected to the needs of the business. They are often “open enrollment”, and seen as a harmless employee benefit. However, this person or group often sees what they are trying to promote as righteous. When they can’t get the attention or support of senior management, it only fuels their view that “they just don’t get it”. 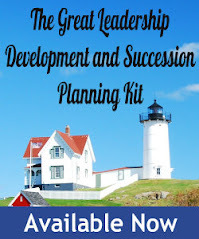 Leadership development is usually seen as training programs, not connected to other talent management practices; succession planning is non-existent. If you are a member of a team like this, GET OUT as fast as your can. By the time a function gets to this point, it’s too late to save it. At some point, someone is going to wake up and start asking questions about the lack of results from this group. And when senior management starts asking for ROI studies, it’s already all over. The best way to fix it is to blow it up and start over. It needs to be re-positioned, it needs new leadership, and a new mission. This is the group that may have seen the early warning signs of stage 1, or perhaps a new function or new leader, and is trying to get its act together. While they don’t have access to senior management, and are not being utilized strategically, they are doing their best to at least understand the business strategy and align their efforts to support it. They know what they should be doing – but may just not know how to get there, or might not have the capability or leadership to get there. Programs are often driven and designed by HR, instead of the senior leaders. So while there may be high level sponsorship – it’s often compliance driven and not seen as mission critical. At the risk of offending a segment of my readers (and we know starting a sentence that way means you’re going to say something offensive), diversity programs used to be a typical example. While these may be noble causes, they are often seen my senior management as “nice-to-do”. Talent management functions like succession planning, training, and recruiting are often siloed and disconnected, sometimes even at odds with one another (i.e., competing competency models). There’s hope for this person or team, but it’s going to take a lot of work. The team may need some new talent. They also need some small, credibility building wins and testimonials. This can be done my working with a few influential middle managers and building some momentum and sponsorship. Design and run “pilots” under the radar – use these as a way to learn. Get out there and start talking to managers at all levels to learn more about the real business drivers and development needs. If your talent management functions are siloed, be the one to reach out and try to work together. If you don’t have a succession planning system, start one – perhaps not for the CEO, but instead for a willing sponsoring organization that is feeling the pain. This is the practitioner or team that’s doing great work and is high demand. Programs and processes are piloted and the successful ones generate word-of-mouth requests for more. Senior management is very involved in driving the leadership development agenda. They determine needs, generate solutions, and set priorities. Most programs are internally created and implemented, with senior managers as the sponsors and/or teachers. Programs are often created as a result of a senior leader reading a good book, and wanting to implement the concepts in their organizations. Other times, the request comes from the need to address a tactical business issue. Practitioners at this stage have a full plate of training programs, coaching, and team development. Talent management functions usually report the same VP, and there is good collaboration and integration. This is the leadership development leader or team that doesn’t just enable strategy – they help create it! They’re not just reacting and responding to requests – they are being proactive and innovative, using their influence to create demand where none would otherwise exist. The trusted advisor tends to have a very high success rate when it comes to adoption of new ideas. Most of their projects are as a result of innovation and new proposals, instead of top-down driven. The trusted advisor often has rare access to the CEO and other C level executives. They are well-read with a high degree of business acumen. Leadership development is seen as something that’s for every level of management – including the executive team. Executives turn to this person to help them figure out what they need to be learning, and how to go about it. This person is well networked both internally and externally, and is seen as a business thought leader. I’m guessing only about 5% of companies actually have someone like this responsible for leadership development – however, they do exist. GE comes to mind – Noel Tichy and Steve Kerr had that kind of credibility when they ran GE’s famous Leadership development program at Crotenville, and Susan Peters has it today. These leaders often have “C” level titles and responsibilities (Chief Learning Officer) and even report directly to the CEO. So how do you get there? First of all, you need to be damn good at leadership development – you need to excel at stage 3. You can’t just jump from 1 or 2 to 4, you have to work your way up and earn it. Then, you’ll need to build your business acumen – learn about your industry, the competition, and your own business model and processes. Finally, it takes a high degree of emotional intelligence (EQ) to be effective at this level. That is, you’ll need to develop your leadership presence, ability to influence, build consensus, and a willingness to put your own ego aside. To be effective at this level, you learn to take pride in getting a senior leader to come up with an idea that they think they came up with on their own – even though you’re the one who planted the seed. So how would you rate yourself, as a trainer, HR pro, coach, or consultant? How would you rate your company’s leadership development function? What do you like or dislike about the model? I am between 3 and 4 but many times it depends on the environment and the people I work with, for and around! A great start. I think there might be a stage five though, where leaders become uninfluential and irrelevant. Similar to McKoewn's Predictable Success model, it's a stage to avoid and move back from, but it's still part of the life cycle. That's a good place to be! Sure, I guess you could become so good at leadership development that you work yourself out of a job.